Jaw-dropping discovery The rare find of juvenile Tyrannosaurus rex fossils, including this nearly complete jaw excavated in 2017, keeps KU paleontologists going back to Montanaâ&#x20AC;&#x2122;s Hell Creek Formation. There is some uncertainty about whether the bones belong to a young T. rex or another species entirely, however, the KU team aims to answer this question through further investigation. Researchers found that the fossil glowed under a black light, which is helpful when separating bone from rock. Team T. rex just returned from another site visit, funded through private support. See more on Page 12. The original Stouffer Place apartments, where the Redlins lived on campus. apart, and we know they’re going to move on to greater things. Bill Redlin is one of these people. I met Bill when I joined KU’s University Relations Department in 1977 as a young broadcaster. He was news director for KANU, the Lawrence public radio affiliate, and I looked up to him — to me, he was awe-inspiring. He was the consummate broadcast journalist, using his deep voice to provide listeners not just the news, but stories with context and thoughtful detail. After working at KANU from 1971 to 1981, Bill was recruited away for a prestigious position in Washington, D.C. Years later, I met his wife, Nina, at KU-related events. Intelligent and engaging, Nina is unforgettable in her own right. She warms up any room with her smile. Like many alumni, the Redlins formed lifelong connections at KU and leveraged their experiences here into successful careers. They have led interesting lives and have become loyal donors — you can read more about their life story on Page 20 of this magazine. Countless alumni have arrived on Mount Oread as young people with potential; their KU educations and experiences have catapulted them into rewarding careers. They represent the best of the Jayhawk spirit — down-to-earth, hard-working and competent. They can stand up to any challenge, anywhere and show the world the quality of a KU education. That is what motivates most KU alumni to give back to their alma mater. It’s a memory of making friends in a collegiate setting with outstanding faculty. But most of all, it’s a feeling of gratitude for a life transformed and the desire to lift others so they can improve their own lives. Each of us has a memorable story of coming to this university in the middle of the Heartland. Regardless of our background, our field of work or where we live, we recognize what the University of Kansas has meant in our lives. It’s a bond that connects us and makes us proud to be called Jayhawks. BUILDING A GLOBAL COMMUNITY OVER WINTER BREAK IN DECEMBER 2017, SIX KU STUDENTS AND TWO PROFESSORS TRAVELED TO TORBECK, HAITI, TO BEGIN THE INITIAL BUILDING PHASE OF A COMMUNITY CENTER. “I grew up in Coffeyville, Kansas. ALLY CRAY KNEW FIRST-HAND THE IMPORTANCE OF DIABETES EDUCATION. SHE HAD THE CHRONIC DISEASE THAT RESULTS IN HIGH BLOOD SUGAR LEVELS. 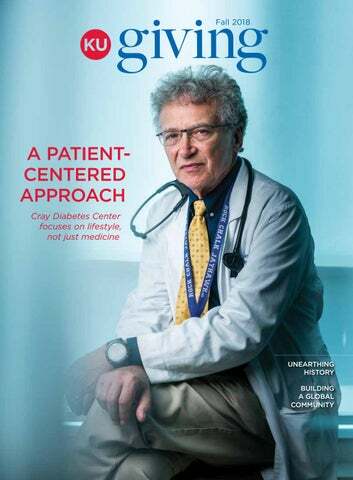 AHEAD OF THEIR TIME: Cloud “Bud” Cray and the late Sally Cray worked with medical professionals to develop a whole lifestyle approach to treating diabetes after Sally was diagnosed with the disease. The Cray Diabetes SelfManagement Center is nearing its 40th anniversary and carries on the couple’s legacy today. community. She died in 2010.
research at KU Medical Center. Institute of Technology in Cleveland. CARING ADVICE: Andrea Dohlman, nurse practitioner and certified diabetes educator, talks with patient Bruce Armstrong about taking care of his feet during an appointment at the Cray Center in Kansas City, Kan.
chance to learn more. Hypoglycemia Unawareness teaches attendees how to identify hypoglycemia (a condition caused by low blood sugar) how it develops, and how to restore awareness. AYS SPENT CROUCHING DOWN DIGGING IN THE DIRT in Hell Creek Formation in Montana through sweltering heat and 40 mph wind gusts doesn’t sound like an ideal summer vacation for most people. To student and staff paleontologists at KU, however, it is an opportunity of a lifetime. The team, led by David Burnham, has discovered Tyrannosaurus rex fossils and brought them back to campus for study over the past four years. The most exciting find to date has been the bones of a young T. rex, first uncovered in 2016. So far, the team has retrieved upper jaws with a complete set of teeth, cranial bones, some back bones, part of the hip and sacrum, and a portion of the foot. The discovery is intriguing because only about a dozen young T. rex examples have been found and, despite the creature’s notoriety in film, little is known about it. Studying the T. rex fossils can reveal how these enormous dinosaurs grew, lived and evolved. “The jaws of the juvenile indicates that it had not yet acquired the huge bite force we see in adults, which is necessary to kill and consume large prey items,” Burnham said. “This indicates there must be differences in feeding and behavior for young T. rex.” The team is still sifting through the findings from their month-long field visit this past June. Among the new fossils collected are thought to be T. rex ribs, teeth and some unidentified fragments, along with a variety of plant and additional animal fossils. Collectively, the fossils provide a snapshot of what life was like millions of years ago. The expeditions have been made possible through LaunchKU crowdfunding efforts and lead gifts from John Weltman and Cliff Atkins, whose son attends KU. IN THE FIELD: KU paleontologists, including undergraduate students mentored by David Burnham, explored Montana’s Hell Creek Formation this past summer with the hopes of finding additional young T. rex fossils. Sometimes fossils float to the surface after years of wind and rain. When a promising area is located, the crew starts excavating with larger tools and shovels. They switch to smaller tools such as brushes and knives once they get to the bone layer. Digging for fossils is quiet, almost meditative work, and the team spreads out to slowly work away at the dirt. THE THRILL OF DISCOVERY: Above: Beautifully preserved plant fossils can tell more about the flora of the area during the time that the dinosaurs lived. Below left: A neck rib bone was collected with other fossils thought to belong to the same dinosaur. Below right: The crew gradually removes all the media around a theropod rib bone so it can be wrapped in a plaster cast and removed for further study. grant funded the necessary pressure, volume and temperature equipment, which they built from scratch in Malott Hall. According to Felix, equilibrium thermodynamics requires patience because capturing the data is a slow process that needs careful attention. “For safety purposes, the equipment included sensors for pressure, temperature and vacuum insulation,” Felix said. “This monitoring was needed at all times to prevent potential explosive consequences. If the sensors reached a set threshold, an alarm would buzz at home under our bed. Now and then, Marie-Therese and I would drive up to the lab in the middle of the night to fix a problem.” Professor Joy K. Ward, associate dean of science research, expressed that the Theeuwes Postdoctoral Fellowship will be important for enhancing collaborations between scientists at KU and in Belgium through this extraordinary gift. “Felix and Marie-Therese have a strong understanding of the commitment and hard work that are required for a successful career in the sciences,” Ward said. “Their contributions to medicine and pharmacy are a source of pride for the university. Through their endowed fellowship, numerous early-career scientists will have the opportunity to thrive at KU while advancing science in ways that will benefit society for many years to come. We are so very grateful for their generosity and support of KU.” Those years in the lab were productive; they gathered extensive data and published eight papers. In 1970, the project was coming to an end and Felix was looking for a job. Bearman connected him with Takeru (Tak) Higuchi, KU distinguished professor and ALZA Corporation vice president of research, which had a laboratory across the street at KU’s West Campus. Celebrating campus diversity This past April, members of the KU community gathered to commemorate the 10th anniversary of the Sabatini Multicultural Resource Center. The center was made by possible through the support of the Sabatini Family Foundation. Hosted by the Office of Multicultural Affairs, the event marked the 2008 opening of the center, whose mission is to recognize and celebrate diversity at KU. #4 The KU School of Pharmacy is No. 4 in the nation in National Institutes of Health funding. Thanking loyal Jayhawks KU Endowment has unveiled a new recognition program to celebrate the university’s most dedicated donors. Jayhawk Faithful acknowledges supporters of KU who have given gifts of any size for two or more consecutive years. Members receive annual appreciation mailings and a Jayhawk Faithful window decal, as well as special items for milestone giving years. Hope for people struggling with addiction As health practitioners, politicians and families grapple with solutions to the opiod crisis, KU is establishing a new resource to better understand and treat addiction. With a $2 million gift from KU alumnus Daniel Logan and his wife, Gladys Cofrin, KU has launched the Cofrin-Logan Center for Addiction Research & Treatment. The center will serve as a hub for addiction research, training and outreach. “The essence of treating addiction is about giving people hope,” Logan said. “Part of what having a center like this does is give the opportunity to have hope that things can be different.” KU professor wins big at Cannes Kevin Willmont, professor of film and media studies at KU, is garnering international fame as the co-writer of “BlacKkKlansman.” The Spike Lee-directed feature film won the prestigious Grand Prix at the 71st annual Cannes Film Festival. The biopic tells the story of an undercover black detective and his Jewish partners who infiltrated the Ku Klux Klan in the 1970s. It is just the fourth American movie to receive the festival’s second-highest award since the category debuted in 1967. “BlacKkKlansman” opened nationwide on Aug. 10. Student Veterans Center.” COL. GLENN MARTIN, BACHELOR’S IN ELECTRICAL ENGINEERING 1986 CENTREVILLE, VA.
ELISSA FROST, BACHELOR’S IN EDUCATION 2014, BACHELOR’S IN OCCUPATIONAL STUDIES 2015, MASTER’S IN OCCUPATIONAL THERAPY 2017 SCOTTSDALE, ARIZ.
God-given talents!” ANGELA BURNES MINNEAPOLIS, MINN.
Professorship honors a life of service The Hall Family Foundation of Kansas City, Mo., has made a $500,000 gift to create the Robert Almy Kipp Professorship of Practice in City Management. The professorship honors Kipp’s career, his civic leadership and his service in the field of urban development. Robert Kipp, of Leawood, had a distinguished civic and professional career, including serving as city manager of Kansas City, Mo., CEO of Crown Center Redevelopment and vice president of Hallmark Cards. “I am honored by this recognition because KU’s city management program has earned a distinguished reputation by instilling a sense of public service as well as humility and morality in its graduates,” Kipp said. continuing education today.” CASEY POELL, M.D. 2002 MANHATTAN, KAN.
“Supporting our students academically, financially and emotionally is so important,” said Gómez Montoya. “We want to help remove any obstacles to their success.” Students who reach out to Jayhawk SOS are already in crisis, so the team needs to be able to move fast to address their issues. One of Gómez Montoya’s goals is having the ability to grant timesensitive gifts to those in need. “Creating a specific fund for emergencies would be so helpful,” he said. “Although it is challenging keeping a positive attitude in the midst of troubling situations, it’s so rewarding to receive a thank you note from a student you’ve helped or see a student return to their normal routine.” The Solon E. Summerfield Foundation provided the initial funding for Jayhawk SOS. THE POWER OF ENDOWED FUNDS PERPETUAL SUPPORT. IT’S A FUNDRAISING TERM THAT MAY BE HARD TO GRASP. But it’s the best way to explain the power of an endowed fund. It means these funds will benefit the University of Kansas as long as it exists. 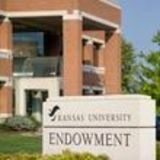 When you create an endowed fund to benefit KU, you enter into a partnership with KU Endowment intended to last in perpetuity. The goal is to ensure that your gift will provide consistent support every year while protecting its value for generations. You decide how to name your fund — in your name, in honor of a loved one, or after your favorite professor, for example. Whatever name you choose will be known at KU forever, creating a lasting legacy. For some purposes, such as program support or a student award, a $25,000 contribution is sufficient. For undergraduate scholarships, the minimum gift is $50,000, which you can donate in installments of up to five years. You can create an endowed fund to support any purpose at KU. We invest endowed funds together with 4,000 similar funds in our Long-term Investment Program, a diversified portfolio. Every year, we spend about 4.6 percent of the market value of each fund to benefit the purpose designated by the donor. Past performance is not necessarily indicative of future performance. Performance is net of external investment-related expenses (e.g., managers, custodians and consultants) and spending policy distributions.